One of the best conferences for BIM and Revit users, the Revit Technology Conference offers users and managers the opportunity to explore new and emerging technologies in the industry. Industry leading speakers, consultants and trainers will be on hand to work with attendees to share best practices, teach new methodologies, and share tips and tricks. 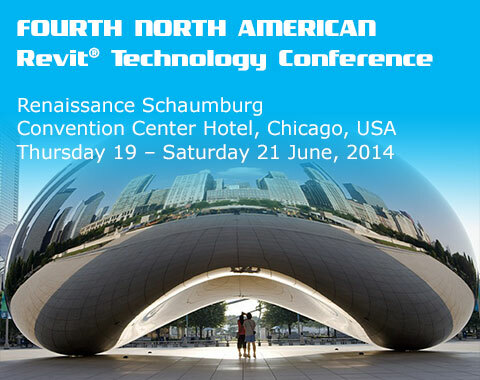 Stay current with the latest happenings at the conference, follow #rtcna2014 on Twitter. Marcello Sgambelluri, one of last year’s top rated speaker will dig into Dynamo for Revit. Paul Aubin, the well known author will be presenting topics that served partly as inspiration for his recent Renaissance Revit book. Aaron Maller. @Twiceroadsfool. Revitforum.org. One the industry’s most well respected bloggers. Jeffery Pinheiro (aka “The Revit Kid” Blog) is going to walk us through going from Revit to Max to Vray. ArchVision’s team will demonstrate some new features while there, including the latest version of Viewport. This version of Viewport offers real time previews for RPCs and the ability to drag & drop rendered views directly into any application that supports alpha masked images. No RPC Plug-in is needed. We’re excited to show it off!